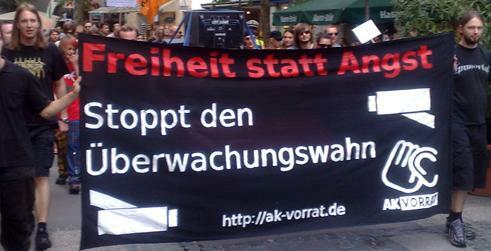 On 31 May 2008, privacy activists organized new rallies in more than 30 cities across Germany. Following the November 2007 protests under the motto "Freedom not Fear" ("Freiheit statt Angst"), thousands of citizens participated in this year's street actions. Numerous demonstrations, rallies, information events, as well as workshops and art performances sent clear signals for the protection of constitutional rights and against the rampant proliferation of surveillance. The rallies had the goal of demonstrating to the ruling grand coalition, a decisive NO of citizens to the blanket collection and storage of data, as well as to the surveillance of all details of daily life. The activities were therefore supported by a multitude of notable organizations, leading to the formation of new alliances in many cities. This underlined the growing force developing behind the well connected movement, the Working Group stated. According to the German Work Group on Data Retention (Arbeitskreis Vorratsdatenspeicherung), the nationwide protests were a full success: "We were able to use the numerous smaller and larger activities to raise awareness in the population and win new supporters. The responses were positive throughout", explained Ricardo Cristof Remmert-Fontes, one of the organizers of the activities. In Hamburg, Frankfurt (Main), and Munich, peaceful conventional rallies were held and received a large turnout. In Munich, 2'500 people also demonstrated against the draft of a new law that is to restrict the right of free assembly. In order to depict the loss of privacy, activists in Nuremberg created an art installation by erecting an entire living room in the city's pedestrian zone. In Bonn, the installation "Transition to surveillance" visualized current developments. In Jena, over-sized surveillance cameras were set up, while in Berlin, a host of talks, hands-on workshops and a preview of the art piece "Pigeon Project" were presented. The live-broadcast of events over radio, realized by a network of independent radio broadcasters, also premiered on the day. The recordings will be available for listening on the website of the German Work Group on Data Retention (in German only). In all cities where the work group is present with local dependencies signatures were collected against the planned "BKA law" (Federal Criminal Police Office law). The petition was signed online by more than 10 000 people by 1 July. The German Work Group on Data Retention is now preparing multiple Europe-wide campaigns which will culminate in mass protests in 11 October across all of Europe. "This is just the beginning - we will keep it up!" commented Michel Blumenstein during the Berlin activities of the work group.